Hucknall has a fascinating history and heritage. Many of the famous people who once lived here, went on to help shape the world, whether through literature, the arts, the built environment or early computing. 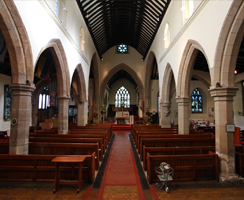 St Mary Magdalene church is fortunate to be the last resting place for the famous poet, 6th Lord Byron; his daughter, the pioneering mathematician Ada Lovelace; and the Victorian bare knuckle boxing champion of all England, Benjamin Caunt. With the help of the Heritage Lottery Fund, volunteers from St Mary Magdalene, local historians and members of historical societies have brought together a wealth of information that tells the story of the town and it’s famous people. 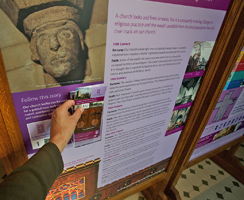 This information is presented in church through interactive interpretive displays and accompanying visitor guide tour leaflets. There are interpretive displays specifically created for children and activities designed to help them engage with and understand the rich heritage around them. Whether your interests lie with the church itself, Lord Byron, our Kempe stained glass windows or the people and events that have helped shape the town of Hucknall, we have something new and exciting for you to experience. Once you have explored our fantastic building and stories, why not relax in the newly developed south transept refreshment area. Stewards are on hand to assist your visit if required and there are assisted and disabled toilet facilities within the church. You can download one of our visitor guide leaflets by clicking the image links, below but you will need to visit church to make the most of them.